Calendar - from the latin Calendarium - meaning "account book". We take it for granted that New Year's Day is the 1st January, but it hasn't always been like that. It all depends on which calendar we use. Stonehenge may be the oldest surviving calendar in the world. The bluestones were erected about 2300 BC with the sarsen stones added in 2100 BC. Although many people believe that the monument was used to fix the summer solstice (the longest day), many archeologists now believe that it was used to fix the winter solstice, the shortest day. This date was important as it marked the start of the new agricultural year and allowed people to work out when to sow next year's crops. This means that the winter solstice has been used as a kind of 'new years day' for more than 4000 years. The Babylonians were the first society to use a calendar in a form that we would recognise today. About 1500 BC they deduced that the Earth orbited the Sun, and worked out that it took about 360 days to complete a full circular orbit. This is why a circle has 360 degrees. They divided the sky into 12 astrological sections (star signs) and developed a calendar system based on the cycles of both the moon and the sun with two seasons, winter and summer. Their calendar had 12 lunar months each of 30 days in length and they added extra days as and when required to keep it in line with the seasons. They also fixed each day as being 24 hours long, two twelve hour periods - one of daylight, the other of darkness - and developed a system of 60 minutes in an hour and 60 seconds in a minute based on their system of calculations using base 60 instead of base 10. They were also the first to have seven days in a 'week' based on the belief that the number seven was sacred. This belief derived from the seven astrological bodies known to the Babylonians that we know as the Sun, the Moon and the planets Mercury, Venus, Mars, Jupiter and Saturn. The ancient Egyptians first used a calendar based on the lunar cycle, but soon realised that this wasn't an accurate method of measurement. Around 1000 BC they switched to a solar calendar that contained 365 days made up of twelve, 30-day months followed by five days of festivals, similar to the Babylonians. This was the first known calendar to use a fixed length for a year. The main difference from the Babylonian Calendar was that Egyptian months were divided into three weeks, each containing 10 days. The ancient Greeks used a calendar known as the Metonic Calendar that was also based on the lunar cycle. It derived from observations of Meton of Athens which showed that 235 lunar months made up almost exactly 19 solar years. This 19-year cycle became known as the Metonic cycle. However, given a nominal twelve-month year, extra lunar months needed to be added to synchronize the cycle. These were added in years 3, 5, 8, 11, 13, 16, and 19 of the cycle. Not the simplest of systems! The Romans created the Republican Calendar about 740 BC, also based on the phases of the Moon. This calendar contained ten months with 304 days. New years day was on the 1st March, and the months were called (in order) Martius (Mars, god of war - March), Aprilus (aperire, meaning ' to open', as in buds of spring - April), Maius (Maia, goddess of fertility - May), Junius (Juno, goddess of the moon - June), Quintilis (fifth), Sextilis (sixth), Septem (seventh), Octo (eighth), Novem (ninth) and Decem (tenth). The 304 fixed days were followed by an unnamed and unnumbered winter period. The Roman king Numa Pompilius (c.715-673 BC) introduced February and January (in that order) between December and March, increasing the length of the year to 355 days. In 450 BC, February swapped places with January, and in 153 BC the 1st January was adopted as New Years Day. With January and February now the 1st and 2nd months of the year respectively, all the other months 'moved forward' resulting in the old numerical names (Quin, Sext, Sept, Oct, Nov and Dec) no longer matching the position in the calendar; December was now the twelfth month not the tenth. The Celtic Calendar dating from about the 1st century BC (sometimes called the Coligny Calendar after the town in France where a stone tablet containing the calendar was found) had the festival of Samhain (31st October) as its new years day. The calendar covered a 5 year cycle made up of 3 years of 12 lunar months each, and 2 years of 13 lunar months each - 62 months in total. The months were divided into fortnights (not weeks) and the last month only comprised a few days so as to make the lunar cycle and the solar cycle match. It was very accurate for its time. The Julian Calendar replaced the Roman Republican Calendar on 1st January 45 BC as the old calendar did not match the solar cycle. By 46 BC the Roman festivals, especially the equinox, were seriously out of sync with the seasons and Julius Caesar asked Sosigenes, a Greek astronomer, to devise a workable long term solution. His recommendation to abandon the use of the lunar cycle and adopt a solar calendar, similar to that used by the Egyptians, resulted in the introduction of the Julian Calendar. This new calendar was based on a solar year of 365 ¼ days, keeping the 12 months from the Republican Calendar but now with fixed lengths. One extra day was to be added every four years to solve the quarter-day problem. These fourth years later became known in the English language as leap years. This name came from the old English hleapan meaning to jump, so called because fixed festivals falling after the end of February jumped forward one day from the last year. In 44 BC the name of the month Quintilis was changed to Julius (July) in honour of Julius Caesar, but after his assassination that year the calendar began to go wrong when the Roman authorities neglected to adhere to the four year rule and instead added an extra day every three years. It was put right 36 years later under the rule of Augustus. In 8 BC the name of the month Sextilis was changed to Augustus (August) in honour of his name, and to make his month the same length as that dedicated to Julius (July), Augustus moved two days from February and added them to August, leaving February with the 28 days we are familiar with today. The length of the year and the months were now fixed, but the Julian Calendar still kept the Roman Kalends (new moon), Nones (first quarters) and Ides (full moons) for the divisions within the months. AD and BC were first used in the 6th century when the Abbot of Rome, Dionysius Exiguus, proclaimed that the birth of Christ should be the event from which all years are counted. Dionysius called Christ's birth year 1 AD (Anno Domini - in the year of our lord), and declared that all years before his birth should be referred to as BC (before Christ). There was no year zero as the concept of the number zero wasn't accepted in Europe at that time. Consequently, 1 BC was followed in the calendar by 1 AD. Christ's birth year was originally calculated from the start of the reign of the Roman Emperor Augustus. The historian, Josephus, and the gospels of Matthew and Luke in the Bible state that Christ was born during the reign of Herod the Great, King of Judea, who according to current thinking died in 1 BC, not 4 BC as originally thought. Roman records state that when Herod heard of Christ's birth he ordered that all children under the age of two years be put-to-death (the Massacre of the Innocents). Based on Herod's revised date of death (1 BC) this would make Christ's birth somewhere between 3 BC and 1 BC. Recent scientific evidence also suggests that the appearance of the star of Bethlehem, which the Magi (Wise Men) told Herod marked Christ's birth, was in fact an astronomical event in June, 2 BC involving Jupiter and Venus. This would make Christ's birth year as 2 BC, which fits with the revised date of Herod's death. If this research is correct, all modern calendars are in effect two years adrift. In reality however, it makes no real difference, as the start dates are all relative anyway! In 375 AD, the Christian Church fixed Christ's birthday as the 25th December. This was nine months after the Annunciation of Mary (25 March - Lady Day) when Gabriel announced to her that she would become the mother of Jesus. It was also the date of the Roman festival of Saturnalia, the shortest day, named after Saturn, the god of agriculture and the date of the Roman festival of Mithras, God of Light. During these festivals gifts were exchanged between friends and candles burnt, and Mithraism had many themes and rituals in common with the modern Christian faith, including the decoration of pine trees and the hanging of branches of holly and yellow mistletoe. Linking these two Roman Pagan festivals with the perceived date of Christ's birth as a single Christian festival was a clever political manoeuvre. It later became known as 'Christmas'. The error in the calculation of Christ's birth year has only recently been discovered and has never really had any adverse effect on people's lives. What did become a problem was the discovery that the calculation of 365 ¼ days for the solar year, (based on a figure of 365 days, 5 hours and 48 minutes), was wrong by some 11 minutes and 14 seconds. At first this wasn't a problem, but by the late 1500s the error meant that the festival that we know as Easter was out of sync with the Vernal Equinox (21 March) by 10 days. The date for Easter is calculated using a lunar cycle and occurs on the first Sunday after the first full moon after the Equinox. In the 1500s Easter was considered to be more important than Christmas and for this reason the Church felt an urgent need to correct the calendar. 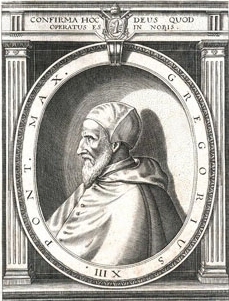 The Gregorian Calendar, introduced in 1582 by Pope Gregory XIII was an attempt to correct the year length anomaly. It kept the 1st January as New Year's Day, but set the year's length as 365.2425 days. Leap years were also kept, but to solve the problem of the extra 11 minutes and 14 seconds, Gregory decided that there would be a leap year every year divisible by four except for century years not divisible by 400. This new system meant that the year 2000 was a leap year, but the years 1700, 1800, and 1900 were not. This meant that averaged over a 400 year period the calendar would be kept in line with the solar year. Most catholic countries adopted the Gregorian Calendar soon after 1582, but England, being a protestant country, didn't adopt it until much later. The official changeover in England came in September 1752 as a result of the Calendar Act 1751. By September 1752, the error in the length of the year meant that England's religious festivals were now 11 days adrift of those in Europe. To bring the calendar back into line the 2rd of September 1752 was followed immediately by the 14th of September 1752 for that year alone. The loss of 11 days from the calendar caused some riots within the population who believed that they had been cheated out of 11 days of their lives by the Government! The change also meant that well known events moved forward 11 days. For example, the start of the financial year, originally 25th March (Lady Day) now moved to the 6th April (the 12th day after the 25th March), a date that is still with us today. The Act also changed the date of New Years Day to 1 January. Consequently, 1751 was a short year, running from 25 March to 31 December. Some sections of English society adopted the Julian Calendar before 1752, with its new years day of January 1st, but before then England operated with three official new years days; the Historical Year that began on 1st January, the Liturgical Year that started on the first Sunday in Advent (3rd December) and the Civil Year that since the 12th century began on 25th March. The introduction of the new Gregorian Calendar as the official calendar meant that England now adopted the 1st January as the only new years day, although the Church still uses Advent as the start of the Christian year. The last European country to adopt the Gregorian Calendar was Greece in 1923. Today, despite the leap year system, the calendar year is still not perfectly in sync with the solar year. This is because the mean year length (365.2425 days) set by the Gregorian calendar is still not exact. The exact length is 365 days, 5 hours, 48 mins, 46 seconds - 365.242199 days, but added to this is the fact that the rotation of the earth is not constant, meaning that a solar day varies in length. For most purposes the difference is of no consequence, but for astronomers who use highly accurate atomic clocks, it is more of a problem. The answer is to add a 'leap-second' to the calendar every so often to keep it in sync. This means that the length of the last minute of the chosen year is extended to 61 seconds. A leap second was last added at the end of 2005 and the next is due to be added at the end of 2008. What has all this got to do with genealogy? The change of New Years Day to 1 January instead of 25 March can cause problems for family historians, in particular those researching their family tree in England and Wales. It is very easy to dismiss a baptism or death entry in the Parish Records because they seem to be at the wrong time. Also remember that there are no records for the period 3rd-13th September 1752 as these days were omitted from the calendar. Here is a typical example of how easy it is to go wrong: A couple who married in May 1750 would most likely have their first child in February, nine months later. However, because New Years Day 1751 was not until the end of March, the birth in February would still be in 1750, not 1751 as we would know it today. To compound the problem the baptism might be in early March, still 1750. If these events were listed in date order (as in the IGI) you might easily dismiss the baptism as being two months before the wedding, and therefore assume that the child belonged to another couple with the same names. The same assumption can also apply to burials of an infant, for example where the burial might seem to be before the child was born. This date change is not too much of a problem when viewing the original church records, as the events are written in the correct order in the parish book, but it is still easy to be misled into thinking that the pages have been photographed in the wrong order when in reality the records are correct according to the old calendar. For events that occurred during and after 1752 (the changeover year) you are sometimes alerted to the change by the date being recorded as 1752/3 etc, but not always and some vicars refused to use the new system for a number of years. Old habits die hard as they say.